Feelin’ lucky? How lovely, but this… this is the road to Hana. Be sure to keep in mind that your “personal weather wishes” may not be granted by ol’ Lady Luck. So, unless you’re a phenomenally talented weather psychic, knowing the forecast can save you a lot of time, disappointment and on occasion, your life. Don’t let your vacation, (or your car), get wrecked by the elements. Get the latest report on the weather before you depart if you’re smart! The Hana Highway (AKA: HI360, “Road to Hana” and “The Divorce Highway”) is the most beautiful, exotic and treacherous, 52+ mile rainforest drive on the planet. It’s earned it’s “marriage wrecker”status with it’s Guinness Book worthy 620 fiendish curves alone. They’re so sharp your passengers will be rejoicing over the 25mph speed limit. It’s truly a blessing to not end up leaving one’s breakfast on the seat. Combine that with a staggering 59 bridges, 46 of which are one lane, (meaning only ONE CAR gets through at a time) and that explains the 2+ hour travel time in each direction that’s without any stops! Feel like gettin’ behind that wheel now? The “Five Most Dangerous Roads in the World” by BMWblog lists the Road to Hana as #5. Sadly, there has been an alarming increase in fatalities on the Road to Hana in just the last few years. (A lack of guardrails and too many tourists driving while looking at foliage, maps and guide books is certainly a factor). Just remember, there’s more to deal with than the typical “lookie loo” drivers going over the edge, or crashing into another car causing it to go over because they were too busy gawking at their guidebook or cell phone along this road to pay proper attention. Let us not forget Mother Nature. All of the area’s waterfalls and roads are prone to flash floods and rockslides. And, unless your personal “super power” is one of accurate psychic weather prediction, it’s always smart to check to see if there are any planned or emergency losures before departing since the jungle and Maui is, and always will be….wild. Still feelin’ lucky? Expect to use approximately 2/3 tank of gas (depending on your gas mileage) in a full day journey, especially if you are unfamiliar with the car and the road. People say to pack a picnic, which is always great if you can’t make it all the way to Hana by lunch. If you do, there are some great places to eat in Hana that you won’t regret. Remember, a heavy meal will cause you to fall asleep or not want to get out of the car to enjoy the views. Avoiding the Emergency Room while on vacation is always a good thing. So what should the newbie tourist avoid? Well, first… when going tramping into the jungle, don’t wear flip flops, unless of course you like having your tender tootsies ripped to shreds by lava rocks. Only closed-toe shoes should be worn on any on or off-trail adventure on island. Second, don’t forget the “Reef Safe” sunblock. Yes, 30 SPF is adequate, but it must be reapplied regularly or you might end up ruining the rest of your vacay. Sun blocking clothes, sunglasses and hats are also a must-have. And third, if injured, thoroughly clean wound and put a bandage on it. If it doesn’t start to look better within an hour or so, don’t wait, seek emergency help. The tropics is a rich breeding ground for bacteria, viruses and fungi that can be extremely nasty and difficult to fight off if left unchecked. Of course if it’t wait, seek emergency help. The tropics is a rich breeding ground for bacteria, viruses and fungi that can be extremely nasty and difficult to fight off if left unchecked. 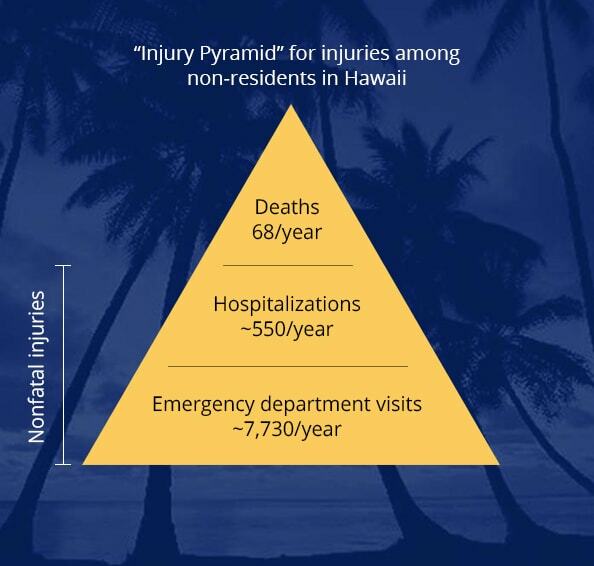 Of course if its a serious injury it’s off to the Emergency Room ASAP…definitely DO NOT WAIT to get to help regardless of where you are located on the island. And, if you can’t get to help right away, send someone fit who can trek out fast to request an ambulance immediately.